What does it mean to be inactive? The word ‘inactive’ can be used to mean dormant. When someone or something is sleeping we say they are inactive because we do not detect much activity on their part. In more scientific terms, ‘inactive’ can mean inert. In these cases it is often used to talk about dead matter with no inherent power of motion. Inactive can also mean lazy or slothful. In LDS jargon, being inactive means that you are not attending church at all or your attendance is very sporadic. In order to understand inactivity it is useful to analyze its opposite. Opposites are merely special relationships; so special that we can really only come to understand one side by understanding the other. Active LDS regularly attend a minimum of 1-3 hours of church meetings a week. The vast majority are involved in far more activities beyond the minimal Sunday services. 1. Attend various meetings throughout the week. 2. Are assigned monthly visitations among the membership. 3. Plan and execute cultural and community activities on an ongoing basis. 4. Perform certain rituals in temples which serve as dedicated space for these ceremonies. Sounds pretty active, indeed LDS are generally very busy people. Not all are necessarily physically active in the sense of getting plenty of exercise, but they keep themselves busy. So what are the specifics of their activity? What exactly do they do? It may be useful to employ a recent trend in social commentary to dissect this subject. 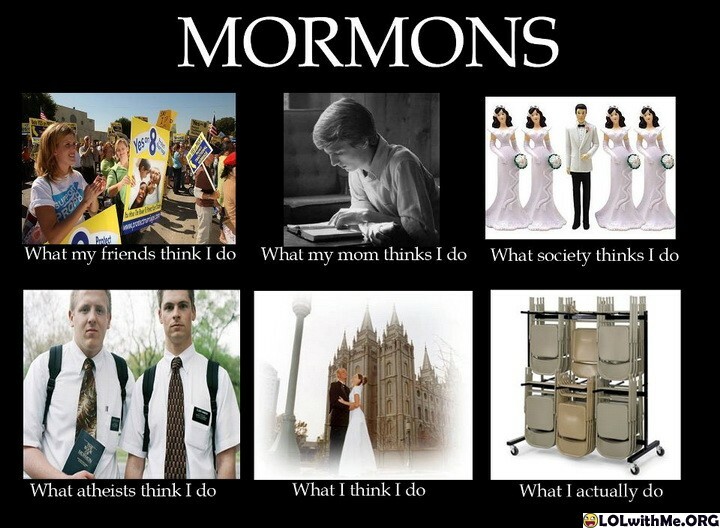 Active LDS think they show devotion to God by attending a myriad of meetings. In these meetings one can expect to find pretty much what you would find at any meeting in modern society. That is, lectures, books, notes, reports, a few people talking, a lot of folks listening and some sleeping while many more are daydreaming, thinking about being somewhere other than where they are in that moment. The active LDS think they are loving their neighbor when they make assigned monthly visits (or phone calls if busy schedules do not permit an in-person visit) to other LDS people in their vicinity. Active LDS think that they serve people through their constant cultural and community events. In reality LDS people serve the interests of corporations. Whether it be a cultural activity as small as a Singles Ward dance or a local Christmas Pageant, or a huge community effort like Mormon Helping Hands preparing the giant metropolis of Rio De Janeiro for the Olympics or a Historic Vaccine Rollout in Africa. It all serves to reinforce Babylonian deathstyles masquerading as righteous lifestyles. In this way the definition of a corporation matches that of a Secret Combination as we read in the Book of Mormon. Active LDS think they are doing the Lord’s Work when they perform rituals in their temples. The first category is comprised of the blind who will end up being leaders within the ranks of the Church and World. The second category is made up of the blind followers who are led by the blind. Both are necessary components of Satan’s gory work. Jesus tells us that both will end up in the ditch. While willfully ignorant Mormons perform vicarious work for the dead they never once supposing that they are the dead. In their pride these individuals fail to see that they are performing dead works in a whited sepulcher. The active member is told that he/she has obtained the highest honor by simply being in the temple. And thus the Devil cheateth their souls. In this way the temples which have now been streamlined and dot the land, function as factories for the continuance of Secret Combinations. Their secretive dispensing of esoteric handshakes and whatnot lay the foundations for the murdering kind of bands that later form using the self same set of symbols. We know this to be the case because this scenario has already played out in every dispensation and is repeating once again. Man-made or should we say Mason-made temples are only stone structures after all. There is a stone that the builders always seem to refuse. As highfaluting symbols of the body, these temples are equally, nay more susceptible to becoming training grounds for apprenticeship under the Fallen. Hugh Nibley pointed out the ancient meaning of temples as universities and universities as temples. As a university professor he was thus a temple worker. He also pointed out to active LDS the dangerous route they were actively pursuing. Working hand in hand to bring about the awful state of affairs spoken of by Moroni, The Nazis and The Niceys, The future fools alongside the Gadianton Robbers of tomorrow don cap and gown and graduate. Neither group is fully aware of the fact that they collectively form that combination which is most secret of all, even hidden from its own members. Members of the Church of Jesus Christ of Latter-Day Saints who remain active as such, do so at a terrible risk. But then again so do Americans, Mexicans, Canadians and basically all people across the planet who consider themselves actively engaged in modern society. Inactivity, meaning infrequent or terminated church attendance, may very well be a part of the solution for you and your family right now, as it will most certainly be an eventual step for all humble followers of Christ in the eternal perspective, but it obviously is not THE answer. We are eternal spirit children of eternal Heavenly Parents, so ‘inactivity’ is never an option for eternal beings. It is rather a question of how and where our eternal flame of activity is directed. As we can see, activity in the church is not what it seems. Activity according to Saltican City is inactivity, slothfulness, trapped potential and misdirected energy according to the Spirit of Truth. What was once a lively body of saints is essentially being rapidly reduced to a Combination of pride and busy-work. The apostasy/atrophy is spreading and the Spirit is quickly vacating. We stand witness along with Moroni of old, to the death and decay. Know this. The LDS church will not recover. Know This, That Every Soul Is Free. Take the good, leave the bad and Press Forward Saints! Jesus said plainly, “The Kingdom of Heaven is within you.” But that leaves us with a very good question. How in the Hell can we let the Heaven out? Well, questions and answers are opposites. As stated previously, opposites are special relationships; two things so close that they are intimately linked. And ironically we find that the best and truly the only way to learn about one half is to learn from or through the other. So let’s look at two principles which we will term ACTIVE & PASSIVE. There is a much more comprehensive list touching on both of these principles in LDSA’s Split Brain Model of the Gospel post. These correspond to your Left and Right brain so I would strongly suggest reading that entire post. Here I will only list a few key operations. It may become increasingly difficult to mentally separate these two states, the more deeply one examines their relationship to each other. This is as it should be, all in one. But God does not want us to be confused so we must learn to combine and utilize both in unison. Our confusion comes only in comprehending these two as separate states. And our insistence that ‘never the twain shall meet’ cuts us off from God. Justin has written a post called “The Tree of This and That,” which is a must read for anyone who is serious in their devotion to God and wishes to overcome this division. If and whenever we find ourselves feeling far from our Heavenly Parents we have to locate some kind of starting point to go from cut off to connected. So we start by making that compartmentalized view which we hold into a positive teaching tool to reverse the effects of having eaten the forbidden fruit. If, as we say in Mormonism, we are to find our way home to God and return with honor, we must stop seeing the passive and active, internal and external aspects of ourselves as existing APART from each other and instead see them as A PART of each other. This looking at the mark is the only way for us to set ourselves apart from the waning world and make ourselves a part of God’s Eternal Work and Glory. So to gain our bearing once having admitted and let go of our misguided ways, we should begin to see our turning away from the institutionalized church not as inactivity, but a glorious opportunity for inner activity. This would be a good saying to keep in mind and use when people come to try and question or pressure us into returning to the ways of the church-world. Tell them, “My inactivity is inner activity. Dispute not because you see not.” Proper understanding of the passive side of life, will come through breathing exercises, scripture study, meditation and prayer. And this understanding will bring personal revelation. No one can tell you exactly what to do. But when the Holy Spirit brings suggestions and solutions to your heart and mind, you must then apply them actively in your life. For that reason it was given. The inspiration will come as it is sought. IF PERSONAL REVELATION IS NOT SOUGHT OR NOT PUT INTO ACTION WHEN RECEIVED THEN DAMNATION AND DEATH WILL FOLLOW. I know this is not what we like to hear, but it is true. There are really only two things in the universe. Those two things are things to act and things to be acted upon, energy and matter, father and mother. In this way life has been and will continue for ever more. Eternal life is happening right now. It is granted unto men to choose or reject it according to their wills. Think about this. For the last 2000 or so years of the Piscean Dispensation humanity has been evolving with the Revelation expressed by the Christ that God is Love…for the next 2000 or so years of the incoming Aquarian Dispensation, humanity’s contribution to the plan will be to realize the next imminent Revelation by the Christ which is the Will aspect of God and this time Jesus will come in power and great glory. The Soul itself is pure electricity arising from the Father Spirit connecting with Mother Matter and all in creation, seen and unseen, exists because of this. We as souls are self conscious electricity and our energy follows thought. In the years approaching the Millennium we will see with more and more clarity that we are not the field of knowledge, nor the knowledge, but the Knower; that we are the Thinker (not the thought). Even Einstien’s great equation is the equation of Spirit in Matter. That is all there is to it. Heavenly Father and Heavenly Mother want naturally to be together to cleave to one another. They are eternally sealed. If we will accept this simple fact we too may be sealed for time and all eternity with them as their offspring. Love and will, can only be understood together. Aligning our will with His will does not mean doing something we don’t particularly want to do just because we think it is what God would like us to do. This is in fact the way of the Devil and should alert us to the truth about so much so called service performed vainly in Jesus’ name. Aligning our wills necessitates knowing. We will only come to know God’s will when we know our own will and this can not happen while following rules set by anyone else. Much of our experience within the church was backwards. So we simply need to flip it around to realize the great purpose of life. Life is to be given and shared in love. Life without love serves no purpose and love without life is nothing. In Sunday School, Seminary or Gospel Doctrine we have all heard it taught that we have spirit bodies. But only now are some of us awakening to the fact that our eyes, ears, mouths and noses; as the primary song goes, are not without their spiritual counterparts. The five physical senses are only the tip of an iceberg of pre-seeding spiritual faculties. As members of the corporate church we wandered around thinking of ourselves as human beings trying to have ‘spiritual experiences’. But when we stop partaking of the Kool-Aid just long enough to start waking up, we REMEMBER THAT WE ARE SPIRITUAL BEINGS TRYING TO HAVE HUMAN EXPERIENCES. I realize that this is a popular and perhaps cliché phrase these days but think about the word ‘trying’ and how it implies that THIS LIFE IS what our spirits aspire to not some next life. Eternal life starts for you when you say it does. The eternal union, the mystic marriage of flesh and spirit is what it’s all about. There are many paths but they all lead to this. Many of them are much more exciting than Church Activity ever was or could be. This is an exciting time for you and your loved ones as paths that were formally forbidden open up you can feel the Spirit of Christ Triumphant, the tingling of the Holy Spirit. And if at this point you can not be sure whether that sensation is of God or of the Devil well then you have two options before you. Either press forward with faith in God or GO BACKwards TO the CHURCH Wards. This entry was posted in Uncategorized by Elder Chantdown. Bookmark the permalink. I think that here there is a hard bone to gnaw. I expect we will be going on better and better, goodness is a good gift for everybody from East to West, from South to North. I like the post but I like them shorter, as a set. Cheers!